The Mystery Setting is a laborious and mystifying jewelry technique that gives the allusion that colorful and brilliant gems (like rubies and sapphires) are suspended in an ornate shape, free of any prongs or visible settings. While other brands like Cartier have patented similar settings, Van Cleef & Arpels firmly remains the leading master, employing it more extensively than any other brand. In December 1933, Van Cleef & Arpels were granted the French patent for their Serti Mysterieux or Mystery Setting. This revolutionary and mind-bending setting was originally used to decorate miniaudieres, or small evening clutches. The Mystery Set was however limited to only flat surfaces until May 1938 when Van Cleef & Arpels patented a new technique which allowed for the invisible setting to curve and twist into three-dimensional pieces of art. The elaborate faceting technique does not rely upon traditional prongs to hold the stone. Each faceted stone is meticulously set on nearly imperceptible gold rails that are less than two-tenths of a millimeter (0.2mm) thick. (To compare, that is about the same thickness as two pieces of printer paper.) The result is a breath-taking, uninterrupted cascade of gems that appear to be entirely free-standing. These seemingly floating gems beautifully mask the elaborate framework of rails beneath them. Any Van Cleef & Arpels piece that employs the Mystery Set takes no less than 300 hours to produce. Because of this painstaking labor, only a handful of these exquisite pieces are produced each year. 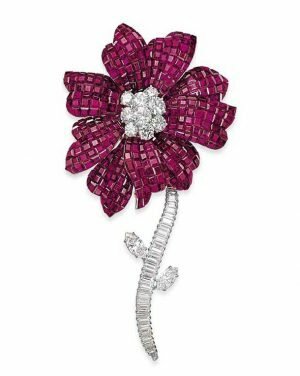 In November 2013, a Van Cleef & Arpels ruby and diamond “Magnolia Brooch” went onto the Christie’s auction block. The sweet flower blossom brooch features a detachable diamond stem and leaves. The winning bid for the piece was a staggering $371,280 USD.